Over the years, Yasodhara Yoga Comox Valley has offered a range of classes, workshops & sacred rituals designed to help aspirants lead lives that are more fulfilling and reflective. In 2017, following many years of selfless service in the Comox Valley, one of our senior teachers, Arlene Trustham, realized her long-time dream of moving to Swami Radha’s Ashram for an extended stay. Her many friends, well-wishers and gurubhais (companions on the spiritual path) miss her energizing presence, as we wish her well and map out next steps for our network. Developed by Swami Radha, Hidden Language Hatha Yoga is a gentle and meditative style that respects the body as a spiritual tool. By working with symbolism, imagery and visualization, the ‘hidden’ messages of each asana are revealed. Hidden Language offers a chance to go deep into the body and the mystical potential of each asana. Stretch, relax and listen to your body’s messages. Every class ends with a guided relaxation. Wear comfortable clothing and bring a journal. Cost: $180 for full series of 18 classes or $16 for drop-in (Income adjustments are possible). Join us to explore the hidden gems of your life path that are found in the ancient yogic Kundalini System. Implicit in Yasodhara Yoga’s approach is that each of us has an inner knowing asking to be remembered. Do you know who you are? What is your place in the universe? Do you know what you are doing and why you are doing it? By tapping into the core beliefs that you hold about yourself you can learn to understand what motivates your actions and opinions. Using the tools and practices of the Kundalini System you will dive deeply into what you believe to be true about yourself. You can keep what is authentic and let go of what is no longer valid. Bring your journal. You are welcome to individual classes, but if you want to go deeper try coming to the whole session or to as many classes as possible. Cost: $16/class or $120 for the 8 week session (Income adjustments are possible). If you have taken the 10 Days of Yoga or the Yoga Development Course at the Ashram and want to keep ‘living the practice’ of Yasodhara Yoga, you are welcome to join this reflective group. We use the spiritual practices of the Ashram to enrich the events of our daily lives. Fee: We encourage a ‘Circle of Sustainability’ donation to the Ashram. 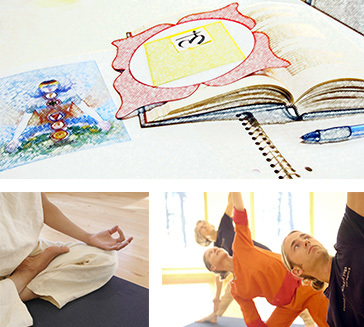 In-person or via-Skype classes and workshops using Swami Radha’s Kundalini Yoga for the West and other teachings of Yasodhara Yoga can be arranged for groups of three or more on request. Contact Arlene.